The Jets have struggled recently, going 3-7-0 in their last ten games. With team struggles comes talk of coaching. It’s only a quite whisper, but it still exists out there. We have come to a point where the Jets have had two coaches tenure over 100 games. Paul Maurice has now coached the Jets for 146 games, and quickly catching up to Claude Noel’s 177 games with the Jets. How have the Jets looked with Maurice versus their time with Noel? 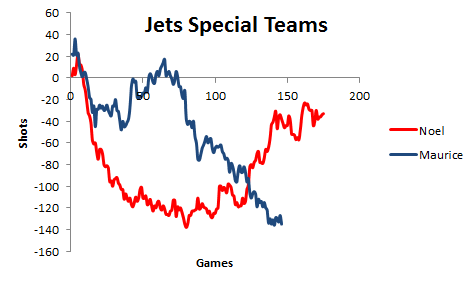 Let’s take a look at the Jets performance between the two and get an idea of performance with some perspective. The above graph shows the Jets shot differential for 5v5 minutes, where all shots are defined as goals, saves, misses, and blocks. In terms of controlling the play and tilting the ice, the Jets have performed exceptionally better in directing more pucks at their opponents net over their time with Maurice. It’s no surprise that they have also outscored their opponents more effectively during that time as well, despite moving to an arguably tougher division. The Jets were a middling team, outshooting nearly as often as they were outshot with Noel. While many can argue that Maurice has the privilege of working with better players, Paul Maurice saw a positive up shoot in the same season that he took over for Noel. 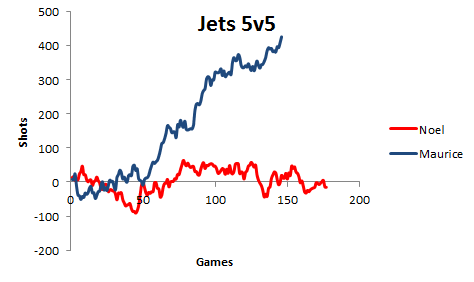 The above graph is the Jets shot differential looking at non-even strength minutes only. There is one issue with this type of analysis. A team allowing a goal early when shorthanded or scoring early when on the power play reduces their opportunity to have special team’s shots. Over the larger sample though the outliers normalize. This is interesting to see. I always thought the one area Noel outperformed Maurice was in special teams. It seems as though this was not always true, although over the long run Noel has been better. There’s no denying that the team has been much stronger for even strength minutes while with Maurice. They have struggled to win the special teams game. A large part of this is not performance while on special teams, but rather the Jets penchant for infractions. Many understand the Jets goaltending has been fickle, and has left a lot to be desired outside of a few hot streaks here and there. Another area though where the Jets have struggled is in special teams. This will need to be improved upon if the Jets are to take the next step. They need to fire Pascal Vincent asap and get a coach that can actually put together a real powerplay. Waiving and demoting Mark Stuart immediately would also help the goals against and the penalty kill.